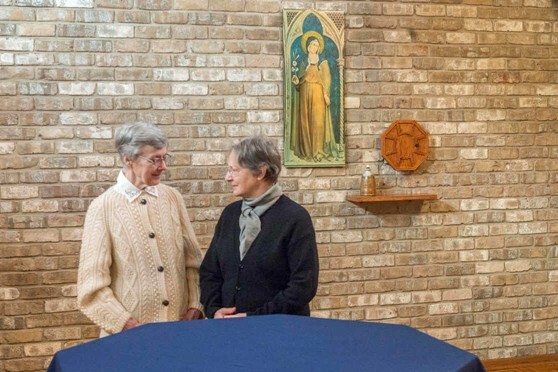 Our Korean Missionaries, Sister Kate and Sister Donna, share a moment in the Chapel before Donna returns to South Korea where her Community is building a new monastery on the Island of Jeju. Sister Kate was the first member of our Community to go to Korea in 1969 at the invitation of Bishop Henry. She studied at the Columban language school in Seoul before heading to Jeju Island. The Minnesoto Poor Clares began work on Jeju in 1971. Donna has been a member of the Poor Clare Community on Jeju from the beginning until the present. The Knights are here; Christmas is not far behind. Gene Drabeck and Bill Weldon stopped in for cookies and coffee. They came representing the Knights of Columbas, Marian Council, bringing the Christmas gifts from all the Knights in our area. The best and brightest of the Knights’ gifts to us are Gene, Bill and Jim Haeg. Jim was not able to come for the party. He had come earlier in the morning bearing beautifully decorated wreaths. These faithful brothers in Christ have helped the Community from the very beginning of the monastery in 1954. 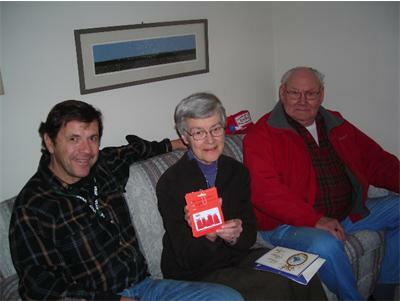 Sister Kate is holding up gift cards from our local Cub food store.